I finally made it to the last and final day of New York Fashion Week Spring/ Summer 2018. It only took me a month to finish sharing =P! This day was an important one for me for several reasons and probably my most enjoyable of the whole trip. My best friend and I started the day in Central Park visiting some of our favourite spots in the park. We had planned to have brunch at the Central Park Boathouse restaurant, right in the middle of the park, which the wait time ended up being almost 2 hours! Neither of us thought the meal was worth the wait, but it was such a beautiful setting, it partially made up for the lacklustre meal. Eggs Benedict is my favourite! That evening, I was invited by Red Carpet Manicure to cover nails and beauty backstage for Prabal Gurung! That's right THE Prabal Gurung! Boy did I feel honoured to be given that opportunity. I also had a chance to interview the lead manicurist, Mei Kawarjiri, who gave me the scoop on what to expect for nail trends this year. Hint hint** almond shape is out, short, squared nails are back in! I even had the chance to rub elbows with the Hadid sisters, Gigi and Bella, as they were both in the show! 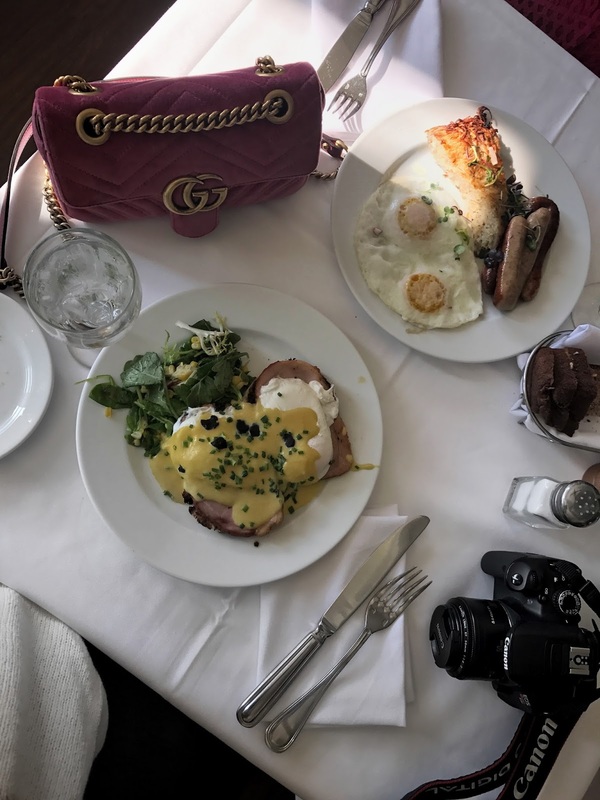 The other big highlight for me was the fact that I was sitting across from two bloggers that I've been following since before I became a blogger myself, Aimee Song and Chriselle Lim. I definitely had several fan girl moments that day. You may have noticed that my blog and social media presence has been lacking lately, and for good reason too. Last year, my health took a hit due to being overworked, overstressed, poor eating habits and lack of sleep. At the start of 2017, I really started to feel the effects of my prolonged poor habits and health decisions. My hormones have been way off balance, my gut and digestion functioning poorly, I've developed food allergies and sensitivities I've never had before and my skin has gone haywire. Dealing with all of this for the last year really took a toll on my self esteem and mood and at times I found myself quite depressed and anxious. Being the major Type A personality that I am, I struggled with the fact that I couldn't control my body's response to all the stress I had been putting it through. At the start of the year, I made some goals to get my health back on tract, but have been frustrated with the fact that even with all my good healthy decisions this year, my body hasn't returned to the healthy state it once was in. So the last few weeks, I've been trying to stress less, sleep even more and really focus on healthy eating habits, hence the blog absence. So please bear with me as I try to navigate through my frustrations and find a healthy balance between work, blogging and living my life =). I do love what I do here and always feel so encouraged when I hear that you enjoy what I share with you guys. I plan to share more on my journey as I try to rediscover a healthy life balance and regain some of strength back. Stay tuned for my next post this week on some of my current beauty favourites (see here!) and leave in the comments below if you like life update posts like these! I love your boots! It's so beautiful! Dear, your health is above all and for me, I will keep always here to support you. You´re a recent discovery but your work is impressive and you´re so kind. Kisses and have a great and "peaceful" weekend! You look so sunny and beautiful! Love the fun encounters you made during fashion week. I'm sure you'll never forget this experience. Love your boots Rina! I hope you get better soon and take more time for yourself. Talk to you soon! That outfit is so cute! I love the details on that sweater. I love the looks of both the fringed white jumper styled with the black leggings and cabby hat and yellow sunnies. The ivy covered stone arch and low pass-through in the first photo is a great backdrop for that first outfit photo. It does look pretty there by the pond in Central Park! Kudos on having the patience to make it past the two hour wait and had an enjoyable brunch-turned-lunch at the Central Park Boathouse restaurant. I also love the yellow Asos Ruffle Blouse with Exposed Shoulder and Neck Band styled with the white Aritzia pants. 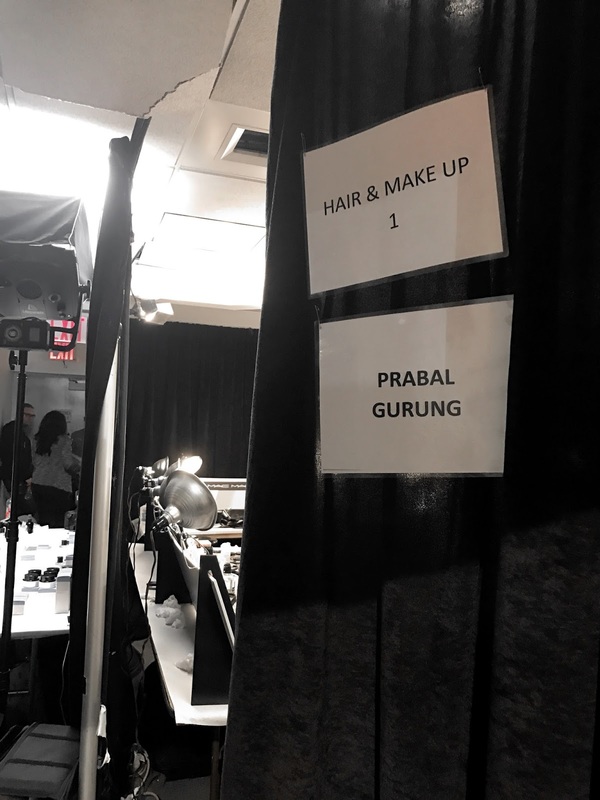 Congratulations on your invite from Red Carpet Manicure to cover nails and beauty backstage for Prabal Gurung! It sounds like fun sitting across from Aimee Song and Chriselle Lim. Food allergies can be scary! It's good reading that you're taking more time to achieve a healthier balance amongst your work, blogging and busy life, and are starting to focus more on taking care of your health! Please do take good care of yourself! Love your lunch outfit, the pink bag is a great pop and your fashion week outfit with the yellow top is stunning - you wear brights so well. I'm so sorry to hear you're having health issues - health definitely does come first. I enjoy your blog and style so I hope you can strike a balance with managing everything and that you have some great medical professionals to help you recover quickly! Nice post! And, I am loving the booties. Such a cool experience Rina, I love both your outfits! Oh dear.. To find a balance sometimes could be very difficult, but you have to learn to prioritise. I hope you feel better soon. And I can't believe you met these bloggers and Gigi and Bella Hadid!! Glad to see the followup to your NYFW adventures. You look fabulous in both outfits. Love those booties. I hear you about posting late, I am still posting my FW street style photos from Paris but then again I took thousands of photos. And wow that is an honor I bet you were having some fan girl moments!! 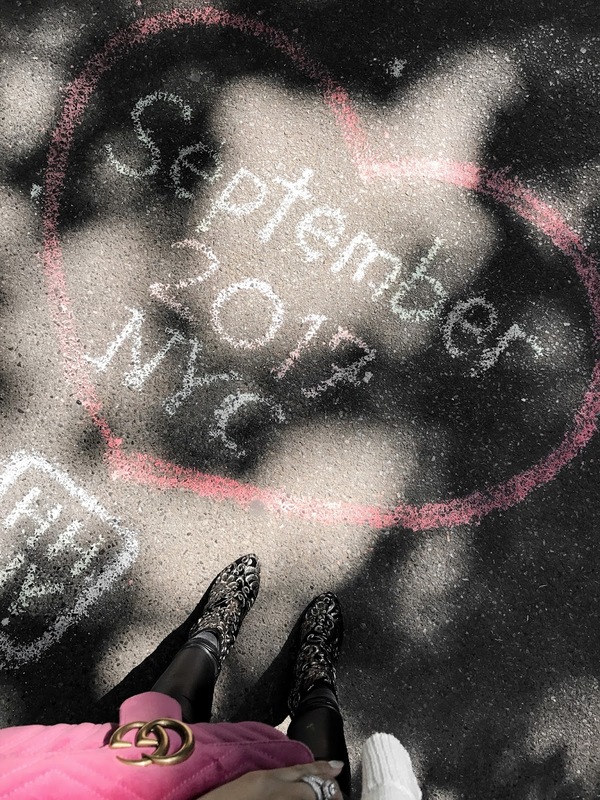 Were you at the Rebecca Minkoff show in NY? Oh wow!! I was just looking at your pics... I'm absolutely amazed! Beautiful look and beautiful photos! I wish I was at the NYFW!! Maybe one day... until then I will enjoy looking at your beautiful photos! Wow you look incredible babe! Obsessed with your style! You really seem to have had an exciting day 5 at NYFW! As for your health state, this is more important than anything else. So take care of it and do not feel frustrated at all. You are beautiful and you are doing a great job here on the blog; so we will be waiting for you here, to be more active when you are ready! These shots are gorgeous! Congrats on being invited to the Red Carpet Manicure, what a great opportunity for you! Good luck with your health journey i know how challenging that can be at times. I’ve been dealing with food and gut sensitivities for the last few years and I’ve changed my diet to be more plant based...and it’s been making a big difference with my gut health and horomones. Hope you’re having a great start to the week. Such a wonderful post and look Rina! I love this look of yours with the baker boy hat and that heavenly pink Gucci bag! So beautiful! And so happy you make it to the end of NYFW! I hope to manage to do NY too next season! By the way how adorable is Chriselle? I met her last year during PFW at a common friend's bday party. She is so nice! Thanks for sharing and have an amazing week! You did the final NYFW post with a blast, love the outfits and your looks. Must be so fun and exciting to meet these celebs. I wish you well with your health, take care of yourself dear! Your boots are to die for! Your outfit has amazing details. Love the leggings and your boots! So chic! Molan muchsísimo los looks, el jersey blanco es divino.